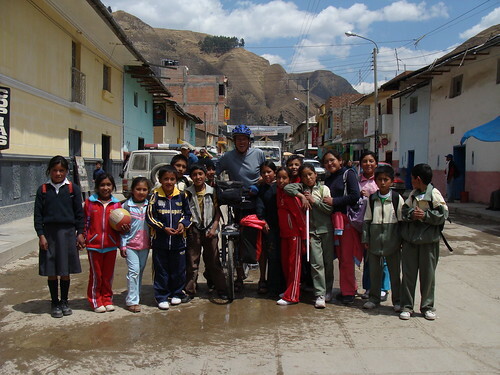 Everywhere we go in Peru the children cry out "Gringo!" It has happened in lots of countries, but they're SO enthusiastic about it here. Some cyclists misunderstand this cultural phenomenon and think that "gringo" has a negative context (or only applies to North Americans). It's just not true. Gringo is just a regular descriptive term, and everywhere we've been it just describes people who talk funny, wear funny clothes, have a funny walk, and probably have money. 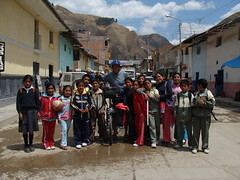 That even includes people from Chile, and can include kids from the city who dress like gringos. Some people have heard the story that "gringo" was something said in Mexico during the various US invasions, and it referred to the green uniforms of the invading US troops, and they were saying "Green Go Home" or something. Well, it might be true (nobody knows) but is has nothing to do with what "gringo" means today. Gringo just refers to any north-American, European, Japanese, or most any foreigner who looks or talks funny. It's not an insult. Of course, like any descriptive term it could be used as an insult. Another little Spanish word that confuses cyclists: Adios. You may have been taught that "Adios" means "goodbye", but in Mexico and Central America it means "Hi and Bye", kind of like I think "Aloha" means in Hawaii. So when you're riding by someone in Honduras and they yell out "Adios", they're not saying "get out of here", they're giving you the most natural greeting they can for somebody who's passing by: "Hi and Goodbye!" People who have 5 words of English have also been taught that "goodbye" means the same thing as "Adios", and it doesn't really. But they'll call out "Good Bye!" as a greeting.